Recently added to Scientific Data and Springer Nature’s list of recommended repositories, the Qualitative Data Repository (QDR) is a CoreTrustSeal certified domain repository that launched in 2014 at Syracuse University. With funding from the National Science Foundation, the Robert Wood Johnson Foundation, and the Alfred P. Sloan Foundation, QDR curates, stores, preserves, and publishes digital data generated through qualitative and multi-method social science research. Publishers and funders are increasingly asking researchers to share their data in domain repositories like QDR, which have the infrastructure and expertise that can help render those data FAIR (findable, accessible, interoperable, and reusable). While there are several repositories that specialize in quantitative data, QDR is the first domain repository in the United States dedicated to storing and publishing qualitative data. help depositors to format and prepare their data to conform to recognized best practices, and to adhere to legal and ethical constraints on data sharing. assist depositors in creating comprehensive documentation. translate that documentation into standardized metadata formats. assign DOIs to all data and ensure their discoverability through metasearches such as OSF Share, the Dataverse catalog, and DataCite search. track the re-use of published data, adding relevant citations to the landing page of re-used data projects, and updating project metadata records so that reuse is captured in citation metrics such as Make Data Count. In addition to storing data, QDR also provides guidance on key issues in managing and sharing data, offers workshops and short courses on data management, and convenes expert workshops on related topics. In addition, the repository develops and disseminates standards and techniques for sharing and reusing qualitative data and for pursuing qualitative research transparency more broadly. Together, the annotations and any underlying sources, plus a Data Overview (which describes how data were generated and analyzed and indicates the “logic of annotation”) comprise a data supplement to the article. Digitally enriching qualitative scholarship using ATI requires participation by and partnership among multiple stakeholders and allows each to do what it does best. Open annotation effectively mobilizes the comparative advantage of article publishers; technology firms that build annotation platforms; and domain repositories that curate, preserve, protect, and distribute FAIR data and materials in the form of open annotations. Publishers continue to publish high-quality research. 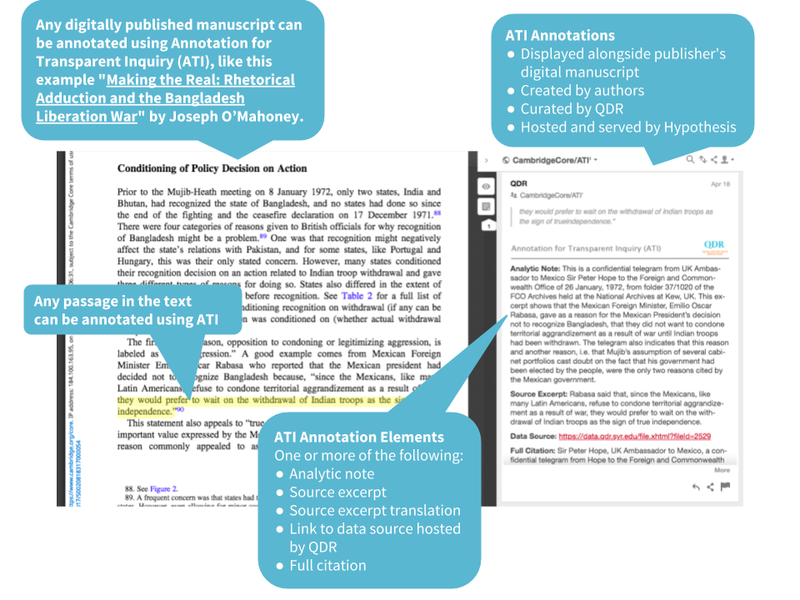 Open annotations are served from an annotation server provided by Hypothesis and mapped to the text of digital articles on a publisher’s web site. When annotation is enabled, annotated passages in an article are highlighted and annotations are immediately available to anyone viewing the webpage. QDR hosts the ATI Data Overview, and the underlying data sources, and preservation copies of the annotations. As a trusted data repository, QDR is committed to long term preservation; to applying appropriate access controls if the sharing of certain data files needs to be restricted; and to maintaining the links between web-based publications and their annotations and data sources (e.g., providing updated versions of data source files when the software designed to access them changes). ATI has the potential to greatly enhance the clarity with which descriptive and causal claims are made in qualitative research, to transform how transparency is achieved, and to profoundly impact the way qualitative social science scholarship is evaluated. This new approach to transparency should thus have a direct and significant impact on the credibility and legitimacy of qualitative scholarship and on its utility for evidence-based policy. Examples of ATI can be accessed here. How Do I Use ATI?